Eggplant is a delicious vegetable / fruit, a must-have in any vegetable patch. Although eggplant can be grown rather easily, a few rules on growing and caring for the plant must be followed to avoid diseases and spur strong growth. 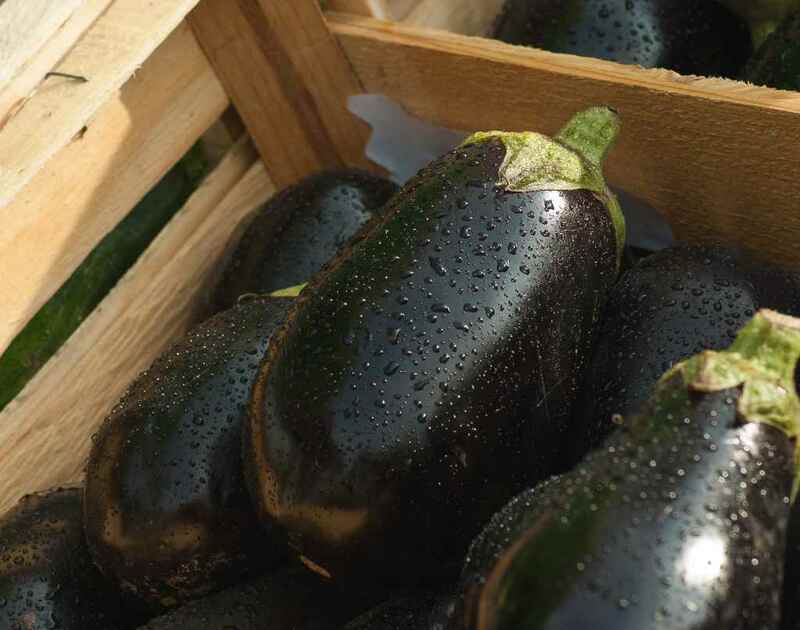 Eggplant can display a great many shapes, colors and sizes, be round or long, purple, pink or white, but every variety is always grown in the same manner. Growing eggplant starts with sowing seeds, but it is also perfectly possible to purchase grown seedlings in your local nurseries. A good deal of sunlight is required. Regular watering during the summer, and temperatures higher than 65°F (18°C) are required. First of all, begin with indoor sowing at a temperature of at least 65°F (18°C) from January/February to April to prepare for transplanting from April to June depending on your zone. Put 2 or 3 seeds per pot or nursery pot. Sprinkle water over lightly to keep the substrate a bit moist. When the seeds sprout, keep only the single most vigorous and beautiful sprout in each pot. Transplant when the ground has warmed up sufficiently (at least 55°F 12°C). When transplanting to the open field, place plants at least 20 inches (50 cm) apart. It is possible to sow directly in the plot if the risk of freezing is over, because eggplants are vulnerable to the cold. If you are in colder zones, wait for mid-May, but you can anticipate that if you are in milder climates. Dig ridges 20 inches (50 cm) apart. Place 2 to 3 seeds in the ridges at 20 inch (50 cm) intervals. Once sprouted, keep the sprout is the most vigorous in every seed hole. To maximize eggplant growth, it helps to plant them closer to, or further from, other vegetables, because eggplants have their friends and foes. Planting certain plants close to other vegetables is an important factor in both failing or succeeding to grow eggplants. Eggplant LOVES growing together with: tarragon, bean, parsley, bell pepper, pea, thyme, tomato. Eggplant HATES being planted together with: onion, potato. Remove side shoots, and especially, pinch the plant once it has produced 2 or 3 bunches of flowers, so that it may branch out. When a plant bears many eggplant fruits, it is good to remove several fruits when they are still small so that only up to 15 or so fruits remain on each plant. This guarantees that you will have plump, beautiful eggplants. Remove suckers that grow out from the base because they tend to drain the plant’s resources in vain. 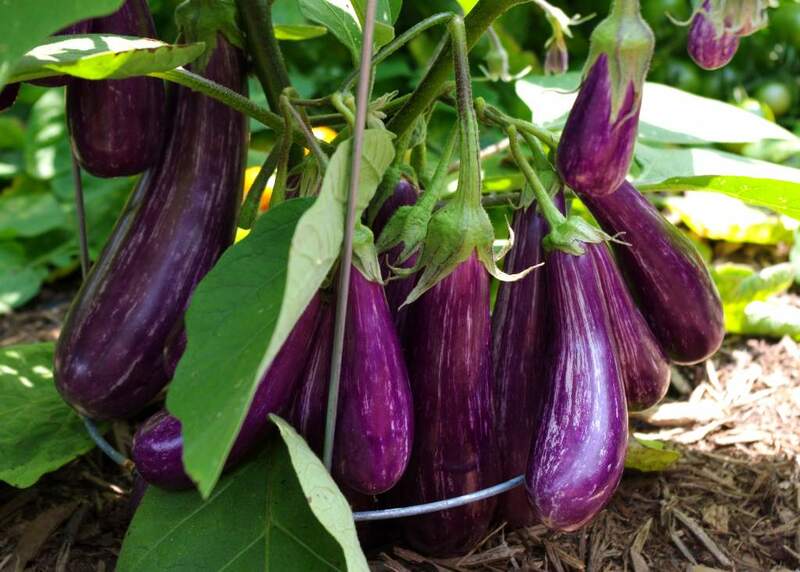 A good mulch at the base of your eggplants helps retain soil moisture and avoid weed growth. 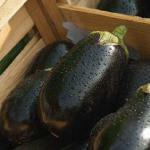 Eggplant, like most fruits and vegetables, is vulnerable to multiple diseases and parasites. 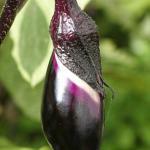 To strengthen your eggplant, add tomato fertilizer once or twice during the vegetation phase and during fruit growth. 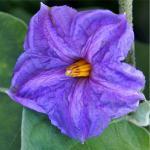 Like the other plants of the nightshade family, eggplant is regularly attacked by blight. 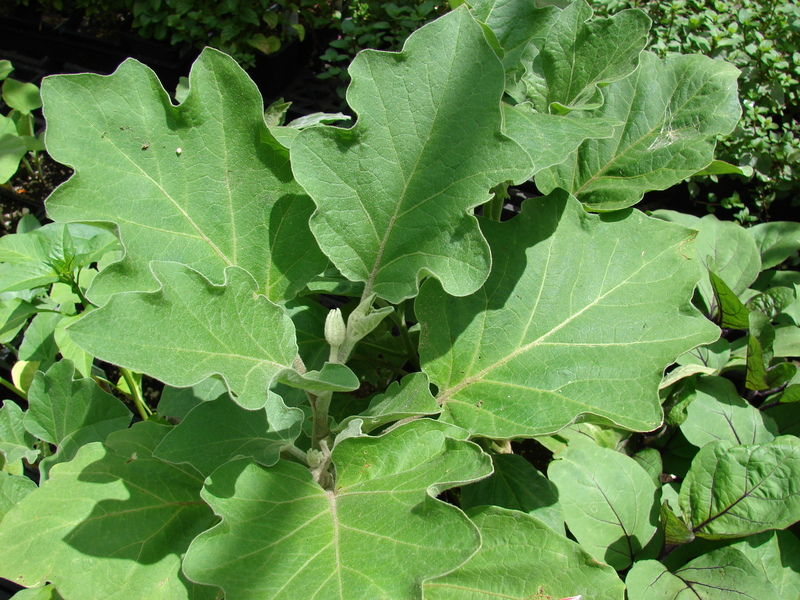 Blight is one of the most common diseases for eggplants. Heat and high moisture spur the growth of this fungus, so be sure to space your plants out as much as possible. When watering, avoid wetting the leaves because this increases the spread of diseases. If plants are already contaminated, the only solution to keep blight from spreading is to destroy those sick plants. Spraying regularly with Bordeaux mixture also protects against the spread of the disease. Oppositely, if the weather is too dry, there is a risk of an onslaught of red spider mites. 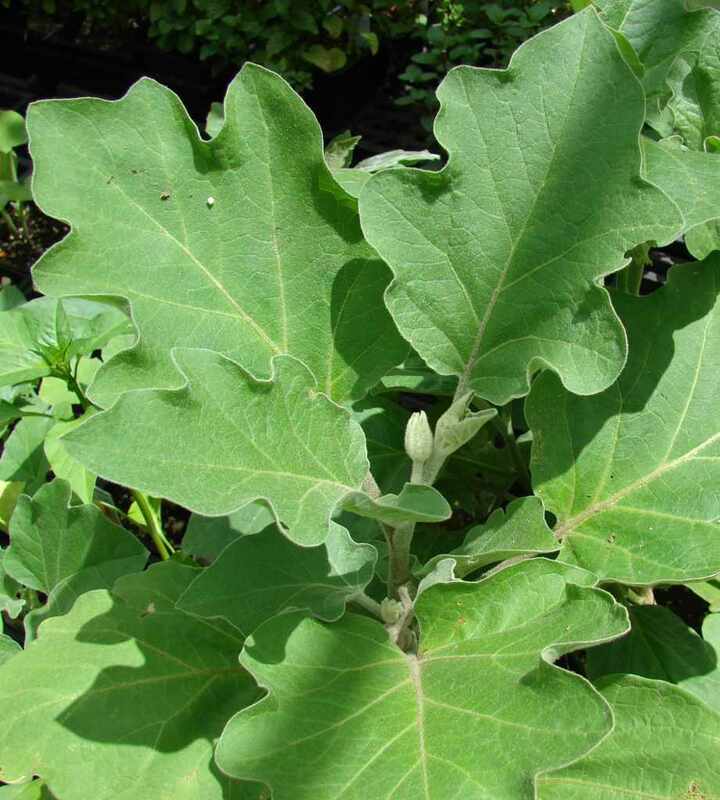 Eggplant leaves are covered with gray spots that then turn red, brown or yellow. Here is how to fight red spider mite. Lastly, but just as devastating, aphids can attack entire eggplant rows. 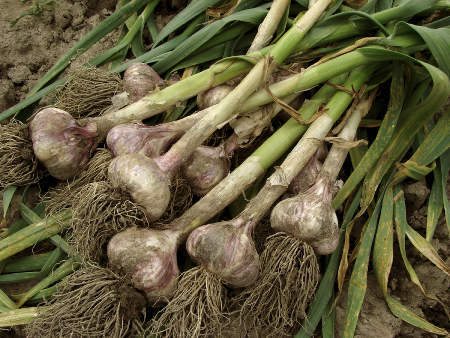 Here is how to fight aphids in a natural way. Together with tomatoes that are part of the same nightshade family, eggplant, in Europe, can also be attacked by this moth since 2009, the year the invasion spread throughout the continent; it can destroy 100% of any given harvest. This shows how to fight against the tomato pinworm (same parasite as for eggplant). Harvesting eggplant takes place around 5 months after sowing but this may vary depending on climate and growing conditions. Depending on when sowing or planting was performed, harvest takes place between summer and fall. 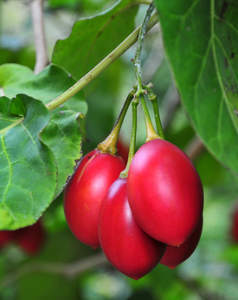 A way to check if the fruit is ripe is when it has stopped growing larger and the skin has taken on a shiny gloss. Originally from India, eggplant naturally favors warm climates to grow, at least 60°F (15°C). 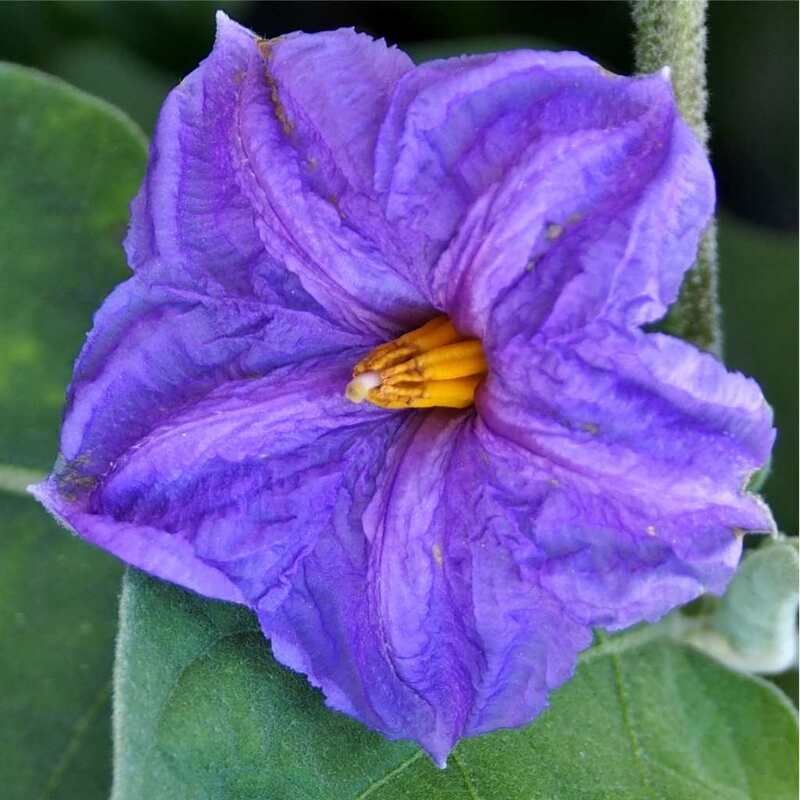 Coming in purple or white colors, there are different varieties in shape and size, but they are all grown in the same manner. It is a summer vegetable much appreciated in such dishes as ratatouille, baked with cheese in an oven or simply as eggplant caviar, marinated in oil with garlic. 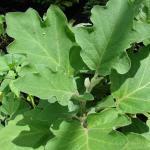 Raw eggplant is not very palatable due to its high saponin content and sponge-like texture. Once cooked, its savors are released and the texture becomes soft and melts in the mouth, similarly to that of the penny bun mushroom. From a medicinal point of view, eggplant boasts strong anti-oxidant properties. Most of these anti-oxidant properties are contained in the cells forming the skin of the eggplant fruit. There are significant quantities of manganese, copper, vitamins B6 and B1, which remain even after having boiled the fruit. 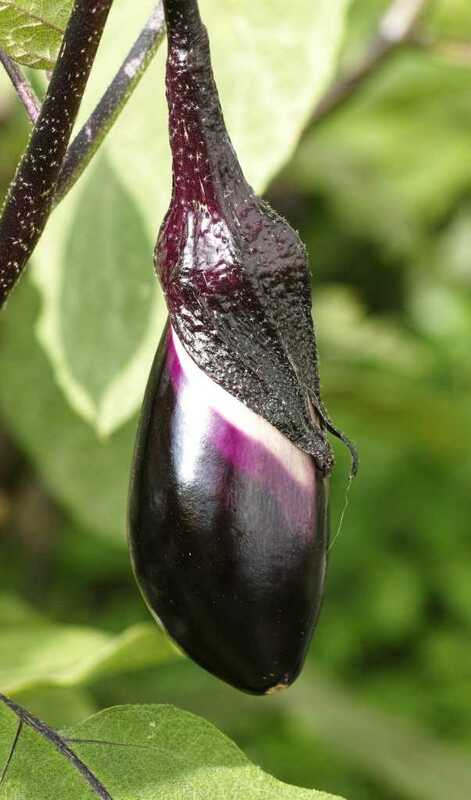 An eggplant is ready for harvest when its hue is deep and its size has reached the normal mature size. You can see this when daily growth marks don’t appear near the eggplant stem anymore.